During Disability History Month 2018 (22 November - 22 December), UCU held its first day of action for disability equality in education, on 21 November 2018, which kicked off our action for Disability History Month 2018. Initiated by UCU's Disabled Members' Standing Committee, the day of action is all about organising against discrimination and will focus on the challenges and barriers faced by disabled people in education. This is an inclusive campaign. We have built a coalition of organisations to work together. In particular especially our sister unions at our institutions - NEU, UNITE, UNISON and NUS—but also we are working with the TUC disabled members committee, Disabled People against the Cuts & Alliance For inclusive Education. The day culminated in a meeting in parliament. the right for disabled people to access mainstream education and a reversal of cuts to SEND provision. 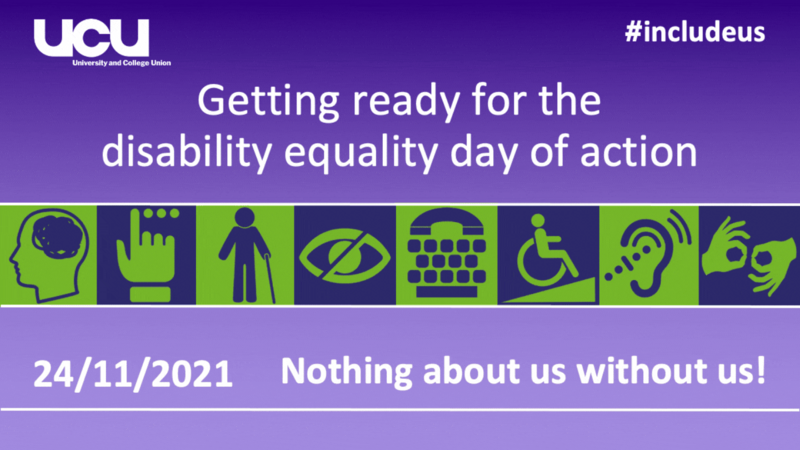 Members and branches are encouraged to continue to raise awareness of disability discrimination (e.g. lack of physical access, refusal of reasonable adjustments & disability leave) and to work with institutions and student union groups for increased participation and improvement of disability rights within structures, employment and access to support and services. We hope that by increasing organisation around disability discrimination we will have fewer members needing support in casework in the future and more disabled members involved and active in our branches. Branches are encouraged to undertake any activity that encapsulates highlighting the challenges and barriers faced by disabled people, as well as the gains made, especially during Disability History Month (19 November - 22 December) and our day of action on 21 November. establish a disabled worker network. help to get the hashtag #IncludeUs trending on twitter! encourage colleagues to write on our 'see the person' downloadable poster the attitudes, barriers or challenges they face daily as a disabled person; or, as a non-disabled person, that they see disabled people face. You can find our disability equality resources here. Branches can let us know what activity they will be doing as part of this campaign by sending an email to eqadmin@ucu.org.uk with details, pictures, etc.